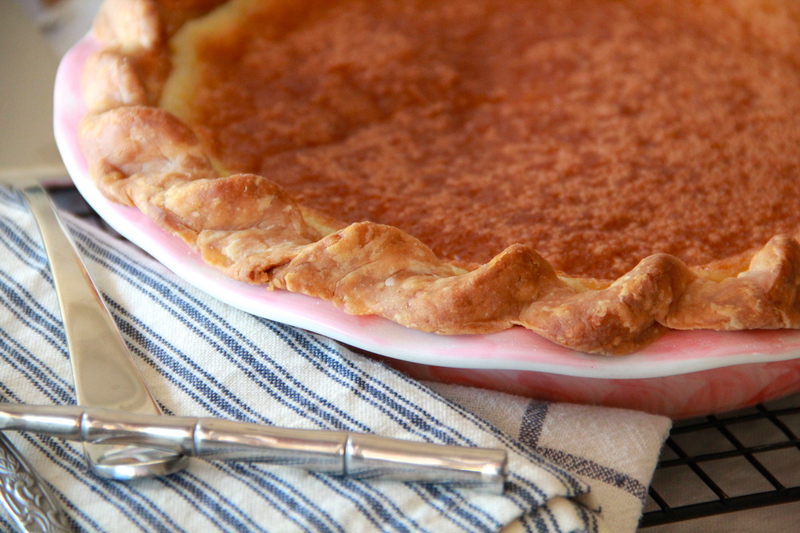 Buttermilk Chess Pie + A Giveaway! I feel like the older I get, the faster time seems to fly. Elders/Wisers — is this a thing? And if so, can we punch this thing in the face? No? Well. At least there’s pie. Have you ever made pie from scratch? I highly suggest it. It’s a bit of work, but just a bit. Entirely worth it, in the end. I kind of feel like the ability to make a pie is a worthy and important life skill. Never done it? Just take it slow. Read all the steps. Chill your dough. Flour your hands. Don’t cut corners. Most importantly, enjoy the process! Throw on some Christmas carols (it’s November, you’re officially allowed), pour some drinks, and get rolling. And don’t stress about it, because if you do then you’ll forget to add the sugar, which I can say with some authority is a fantastic way to truly ruin a pie. I usually stick with a few trusty pie recipes around the holidays — pumpkin and pecan are my go-to guys — but when it comes to pie, the options are boundless. See that? 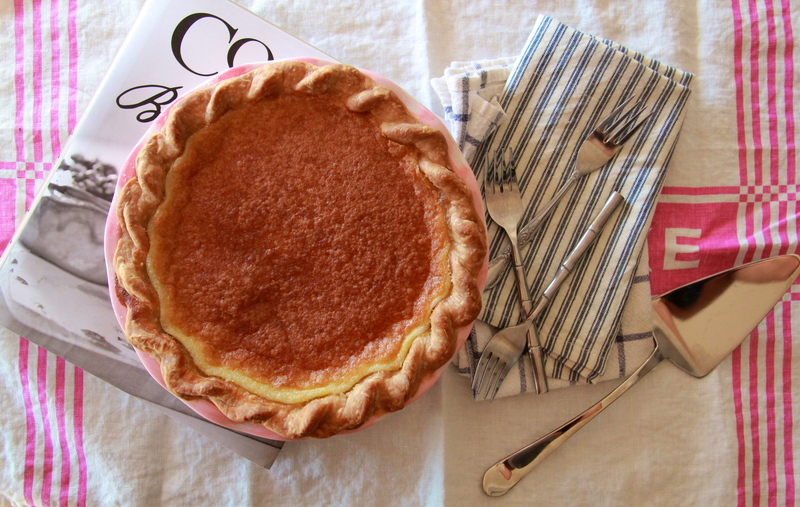 That’s a buttermilk chess pie. 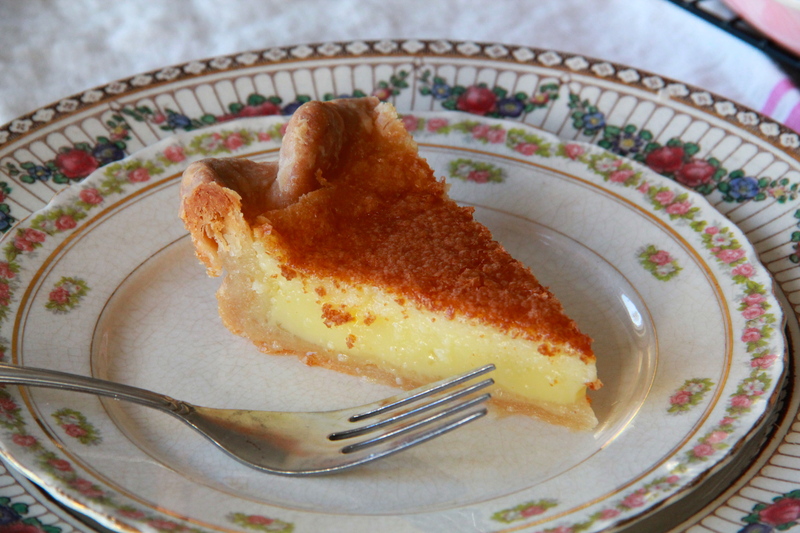 I’ve been reading about chess pie for ages, on other blogs and in magazines, but I’d never seen or tried one in real life. So when I got a copy of the gorgeous new Cook’s Illustrated Baking Book, I knew exactly what I wanted to try first. 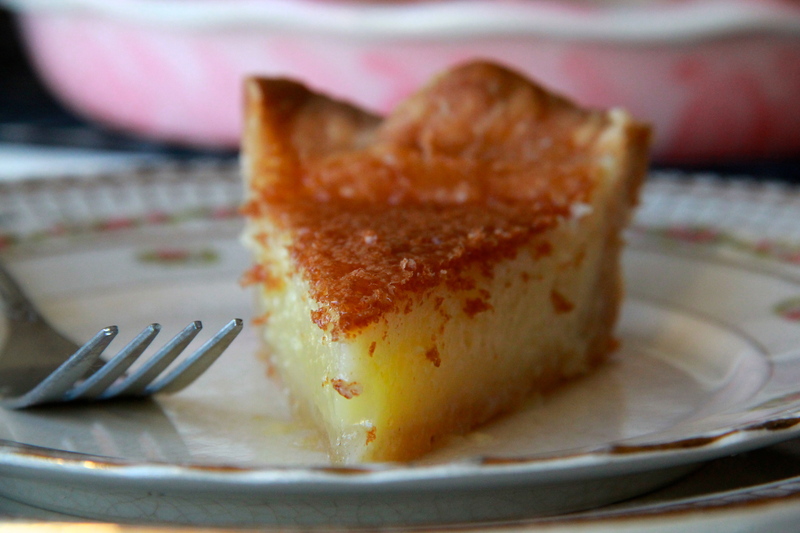 In the book, the recipe for chess pie is actually a variation of a recipe for buttermilk pecan pie with raisins — simply omit the pecans and raisins and HELLO, CHESS PIE! It’s got a toasty, crackly top shell which gives way to a soft, creamy, sweet custard filling — the buttermilk is there to balance out all of the sugar, although it’s definitely a sweet pie by nature, so next time I’m going to try it with the toasted pecans, too, which I’m sure would help further ground the sweetness. The Cook’s Illustrated Baking Book, put out by the incredible food geeks (and I mean that in the best way possible) at America’s Test Kitchen, is nothing short of amazing. It’s a behemoth of baking intelligence and know-how — over 450 recipes! Each with extensive headnotes outlining the science behind the pie — or cake, cookie, custard, bread, brownie, pastry… pretty much anything you can bake is covered in this bad boy. Personally, I’ve got my eye on the recipe for buttermilk doughnuts. Or maybe the lemon layer cake? No, wait, first I want to try the chocolate-raspberry rugelach. …ECLAIRS! Let’s make eclairs. Want a copy of this baker’s bible? Lucky for us, the generous folks at America’s Test Kitchen have offered to gift one copy to a Dunk & Crumble reader — that’s you! 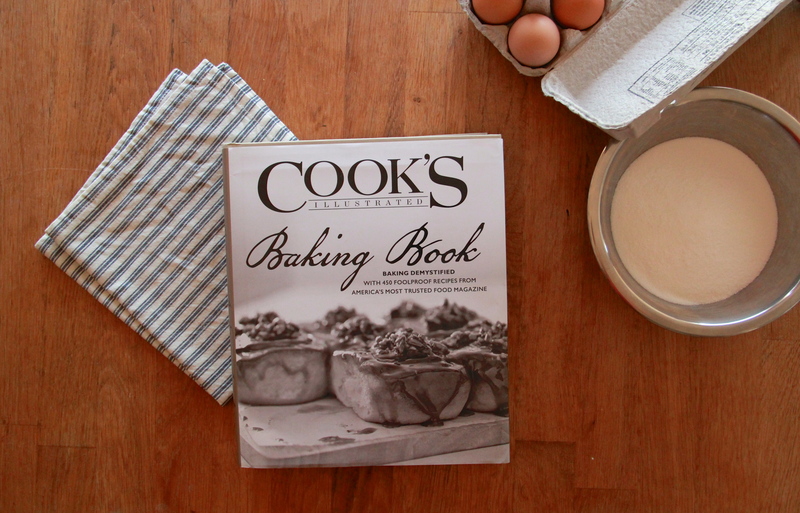 And all you have to do to win one bona-fide copy of the Cook’s Illustrated Baking Book is leave a comment, below, telling me about your very favorite thing to bake for the holidays (also you have to live in the US, for shipping reasons). I’ll choose a winner at random on Sunday, November 17th. Also, in the name of full disclosure, I was given a free copy of the book in exchange for my review, here. I don’t agree to do these kinds of things unless I fully support the company/product I’m endorsing, and I’ve been an avid reader of all things America’s Test Kitchen for years now (the baking buck stops with them, as far as I’m concerned). Needless to say, I was thrilled to accept my copy and the chance to gift one to one of you lovelies, too. Don’t forget, you’ve got until Sunday, November 17th (at noon Pacific time)! So tell me — what is your favorite thing to bake for the holidays? THANKS GUYS! THE CONTEST IS NOW CLOSED — CONGRATULATIONS TO SUSAN T! If you want to make this a buttermilk pecan pie, simply add 1 cup chopped, toasted pecans to the custard mixture before pouring it into the par-baked shell and baking. To make the pie dough, dump the flour, salt and sugar in the bowl of a food processor fitted with the steel blade. Pulse for about 5 seconds to combine. Add the cubed butter and pulse about 10 times, until the butter has been processed into bits of various size. With the motor running, pour the ice water down the feed tube and continue to pulse until the dough starts to come together. Transfer the dough to a floured surface and gather it into a flat disc (it will be a bit wet and sticky – flouring your hands will make it easier to shape). Wrap it tightly in plastic wrap and chill for at least 1 hour in the refrigerator (or about 30 minutes in the freezer). Once the dough has rested and chilled, heat the oven to 375 degrees. Remove the dough from the plastic wrap and set it on a well-floured work surface. Use ample flour and a rolling pin to roll the dough into a large circle, about 1/4-inch thick. Carefully transfer the rolled dough to a 9-inch pie dish, handling the soft dough gently and crimping the edges to your liking. Place the crust-filled pie dish in the refrigerator or freezer to allow the dough to re-firm before you par-bake it. Once the pie shell is good and chilled, line it with parchment paper and fill it with pie weights (dried beans work beautifully if you don’t have “official” pie weights). Par bake the crust until it looks pretty dry but it still light in color, about 25-30 minutes. Take the par-baked crust out of the oven and remove the weights and parchment. Place it on a rimmed baking sheet. Lower the oven to 300 degrees. While the crust par bakes, mix up the filling (it’s important that the crust still be warm when you pour in the filling, so try to have the filling ready when the crust comes out of the oven). To make the filling, melt the butter in a heatproof bowl set in a skillet of barely simmering water. Remove bowl from skillet and stir in sugar and salt until butter is absorbed. Whisk in eggs, then buttermilk until smooth. Pour buttermilk mixture into warm, prebaked pie crust, and bake the pie until the filling is golden brown and looks set but yields like Jell-O when gently pressed with the back of a spoon, 50 minutes to 1 hour. Let the pie cool on a wire rack until the filling has set, about 2 hours. Serve slightly warm or at room temperature. I’m not in the US (bummer) but this pie looks awesome. Since I’ve been little we’ve always made my mom’s fudge around the holidays. It’s the best! I love to help make pies with my grandmother. I’m going to attempt macaroons this holiday season, we’ll see how they turn out! You know me, pumpkin pie. You should have made the deadline Saturday Nov. 16th. All hail America’s Test Kitchen! They are my go-to when I need a fail-safe recipe. As an avid baker, I LOVE making gingerbread houses from scratch during the holidays. One year I got ambitious and made a 3-foot tall gingerbread Eiffel Tower. Btw, I love your blog! I discovered it about a year ago and have been reading it since. 🙂 I’ve got a cake business in Napa, so if you ever make a day trip to wine country I’ve got some great recommendations! I’ve made the same caramel cake for Thanksgiving for the past 5 years. It uses 3 sticks of butter and is worth every ridiculous calorie. My favorite thing to make for the holiday season is Date Balls. They’re delicious and I look forward to them every year! That pie looks so yummy! For Thanksgiving every year I make these whole wheat rolls my dad made when we were kids. I’m pretty sure he just got the recipe from the back of the flour bag but they are THE BEST and the smell of them always brings me back to holidays when I was young. For a few years, I was making whiskey fudge for the holidays. The recipe got away from me, but my mom mentioned it the other day so I should probably try and find it or come up with a new one! Pie looks amazing. I make “Forgotten Cookies” with dark chocolate chunks and chopped walnuts. These gems bake in the oven over night and taste like heaven. A dear friend gave me the recipe as a gift at my wedding shower. Best gift ever. During the holidays I bake Nana’s pie crust, with as many different fillings as I can (in separate pies of course). Honestly, I love to bake anything I can during the holidays-the break from school gives me a chance to try new recipes. I will say, though, that I’m particularly fond of pumpkin pies and baked apples and things with fresh cranberries in them. My favorite thing to bake over the holidays are snowball cookies. My boyfriend has a handwritten recipe from his great grandmother, and we’ve been making them together since high school! I love to bake dark chocolate covered macaroons!! Baklava – it’s my grandmother’s favorite and my mother makes it for her every Christmas! Christmas sugar cookies shaped like bunnies. Melty Chocolate gingerbread cookies. So good. My favorite thing to bake for the holidays is cranberry-strawberry pie! I once found this recipe for World Peace Cookies… that’s my new favorite thing to bake during the holiday season! Brown Butter Chocolate Chip Cookies with Sea Salt. I have my own recipe that was created when I mistook a cup of butter for a pound of butter. Amazing. I am a restless cook, and rarely make the same thing twice or certainly not the same way twice. But I grew up down the street from a cranberry bog and have a deep loyalty toward those glittering red fruits. I make cranberry sauce for Thanksgiving no matter where we are, who we are sharing the meal with. It’s chunky, tart, sweet, and redolent of oranges and childhood memories. I make a serious amount, and eat it for breakfast with yoghurt or for lunch with cold turkey for days after the feast. I made the BEST turkey a few years ago. A southwest take on Thanksgiving with chipotles. It was delicious. My favorite thing to make is dessert – pumpkin cheesecake pie, caramel apple streusel pie, apple crisp. I love to bake my Grandmothers coconut cream pie.